Today, economic growth is widely understood to be conditioned by productivity increases which are, in turn, profoundly affected by innovation. 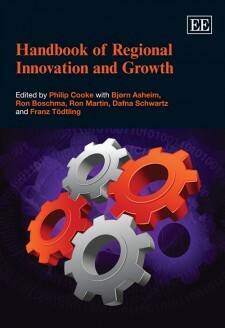 This volume explores these key relationships between innovation and growth, bringing together experts from both fields to compile a unique Handbook. The introduction of endogenous growth theory has led to new interest in the role of the entrepreneur as an agent driving technical change at the local regional level. This book examines theoretical and methodological issues surrounding the interface of the entrepreneur in regional growth dynamics on the one hand and on the other presents illuminating case studies. In total the book’s contributions amplify understanding of such critical issues as the relationship between innovation and entrepreneurship, the entrepreneur’s role in transforming knowledge into something economically useful, and knowledge commercialization with both conceptual and empirical contributions.The emergence of endogenous growth theory has unleashed a flurry of new hypotheses and related inquiries that have in turn created an exciting dynamic in the conceptual, theoretical and empirical foundations of the field. A central feature has been the recognition that local initiatives matter in how regions grow and adjust to changes and shocks. Moreover, it is the role of technical change, driven by entrepreneurs, that motivates these initiatives. This volume begins by outlining and explaining the theory and method behind entrepreneurship and development. This is followed by specific case studies of practice and policy. These cases are region specific, offering the reader concrete, empirically based research results. Scholars and students in economics, entrepreneurship and public policy will find this volume a valuable tool in understanding the latest research in regional economic development. Increasingly, endogenous factors and processes are being emphasized as drivers in regional economic development and growth. This 15 chapter book is unique in that it commences by presenting five disciplinary takes on endogenous development from the perspectives of economics, geography, sociology, planning and organizational management. Several chapters demonstrate how researchers have developed operational models to investigate the roles played by endogenous factors in regional economic development, including the role of entrepreneurial rents. Further chapters provide empirical investigations of endogenous factors in regional development at various levels of spatial scale – from the supra-region to the nation, city and small town – and in a variety of situational settings, including the European Union, Asia and Australia. The book is an invaluable up-to-date resource for researchers and students in regional science, and regional economic development and planning. This up-to-date and insightful book presents post-crisis scenarios for European regions with new methodologies and tools to support quantitative assessment and foresight. The aim is to develop regional forecasting methodologies and tools, appropriate to the regional-local scale but consistent with a general EU-wide approach. This effort is particularly important in a period of economic crisis, as an economic downturn generates high uncertainty about the future of economic systems, and consequently will determine the new winners and losers in a globalized world. An interesting picture of diverse and alternative post-crisis territorial development paths is provided for a case study of the Latin Arc countries (Spain, France and Italy) and the Latin Arc Provinces Network, running along the Western Mediterranean coast. Policy suggestions for the case study area are then built on the scenario results. Spatial Scenarios in a Global Perspective will strongly appeal to regional economists, economic geographers and policy makers as well as students in regional economics, geography and international business.